WearCheck provides condition monitoring services to many sectors, some of which are highly specialised. 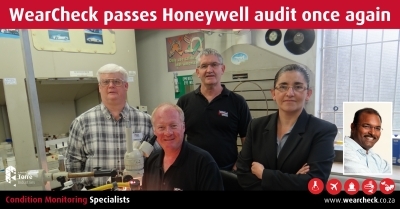 One of WearCheck’s long-standing customers in the aviation arena is Honeywell Aerospace - a global company that invents and manufactures technologies that address some of the world’s most critical challenges around energy, safety, security, productivity and global urbanisation. Honeywell ‘s SOAP (spectrometric oil analysis program) laboratory engineer Perry Rexroad, from Phoenix Arizona, recently visited WearCheck’s Pinetown laboratory to conduct an audit of the process of preparing the oil filters for analysis as well as laboratory instrument accuracy. For more than 20 years, WearCheck has analysed oil samples and filters from Honeywell’s aircraft components, and our diagnosticians have based their maintenance recommendations on these results. As this work is unique and specialised, Honeywell requires that our diagnosticians are specifically trained and certified to diagnose their samples, and that they undergo regular assessment to earn re-certification. During the audit, WearCheck’s three existing Honeywell diagnosticians (Daan Burger, Ravi Chetty and Steven Lumley) were successfully re-certified, and Ashley Mayer, the newest member of the diagnostic team, also received his Honeywell certification. Ashley Mayer, the newest member of WearCheck’s diagnostic team, is now the fourth diagnostician to be certified by Honeywell, along with Daan Burger, Ravi Chetty and Steven Lumley.